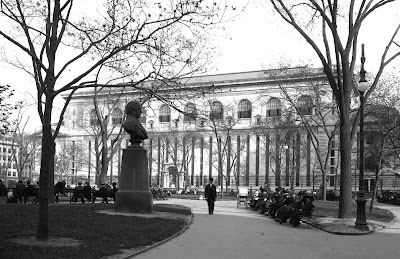 In this post, BPC’s archivist Anne Kumer, shares the history of one of Bryant Park's former monuments. Currently, the Bryant Park grounds are home to several monuments that pay homage to artists, writers, and leaders. 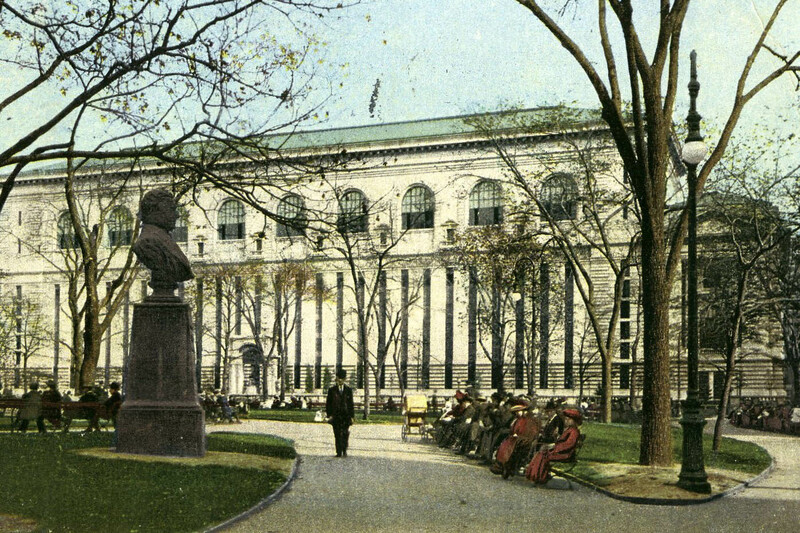 Some, such as the statue memorializing William Earl Dodge in the Reading Room, originally stood in other parks and courtyards throughout the city before making their way to Bryant Park. 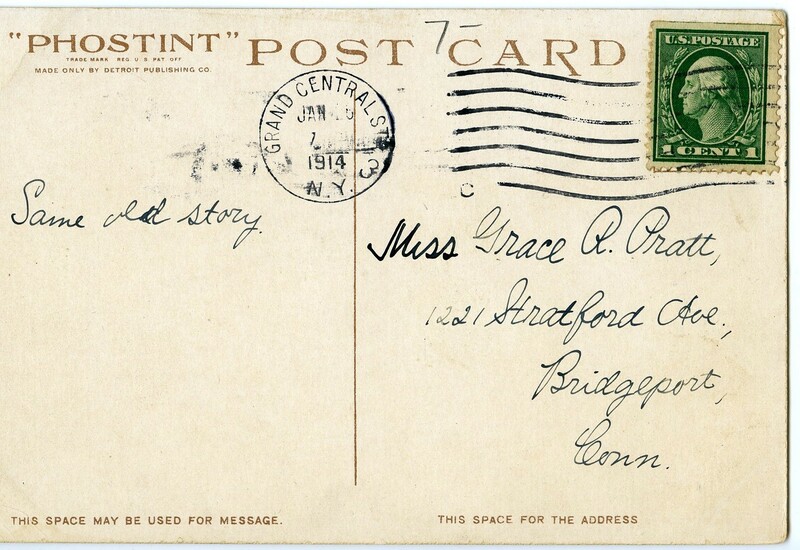 (Dodge’s original home was Herald Square.) Others, such as a bust of American author Washington Irving, resided first in the park, and have since been moved elsewhere. My interest in this particular statue was first piqued when I found (and bought) this postcard at the Brooklyn Flea. In case you can't read the back, it says "Same old story" and nothing else. A perfect non sequitur circa 1914. In the late 1800s to early 1900s, a large bronze bust of Washington Irving, mounted on a granite pedestal, stood in the south side of Bryant Park. The author of “Sleepy Hollow” and many other works, Irving was one of the first American writers to gain international acclaim. The statue was donated to the City of New York in 1885 by Joseph Weiner, a German physician and admirer of Irving’s. Sculpted by artist Friedrich Beers, the bust was originally intended for placement in Central Park. Upon completion some members of the NYC Art Committee declared it a success, while others insisted that it wasn’t flattering enough to Irving. 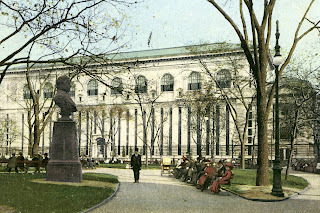 The Commission decided to put the bust in Bryant Park, because Irving had served on the park’s advisory council at one point. It remained in the park for many years, and possibly up until the 1934 renovation. Some say that the statue was moved before that, lost, and then later recovered in a storage shed under the Williamsburg Bridge. 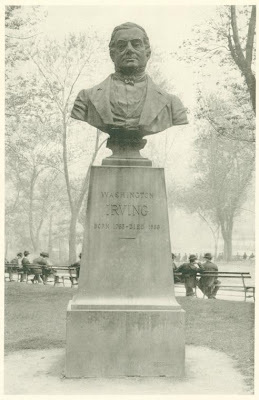 In 1935, the Irving bust was moved to Washington Irving High School (go bulldogs! 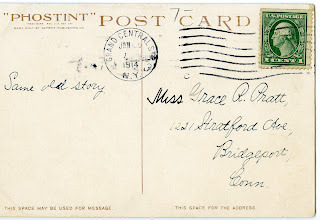 ), where it remains today. Look here for more details on the history of this and many other NYC statues, and of course, here, for more information about NYC parks, including the other Washington Irving bust, located in Brooklyn's Prospect Park.